Any writer overwhelmingly honest about pleasing himself is sure to please others. 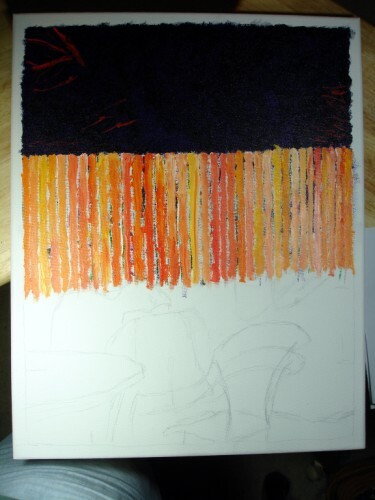 I started my next painting today - sort of. 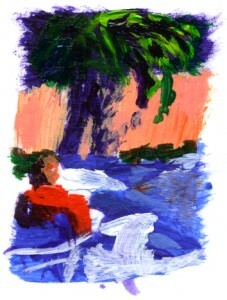 I decided to paint a 1" thumbnail of the painting first with a big brush. The actual painting itself will be 16" x 20". This exercise forced me into sheer values. 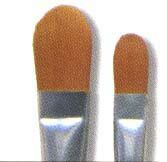 Below is a magnified view of the literally thumb-sized sketch. 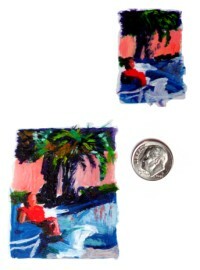 Next, I'll do the same thing but on a 3" scale. This is a good way to test colors and temperatures, I think. 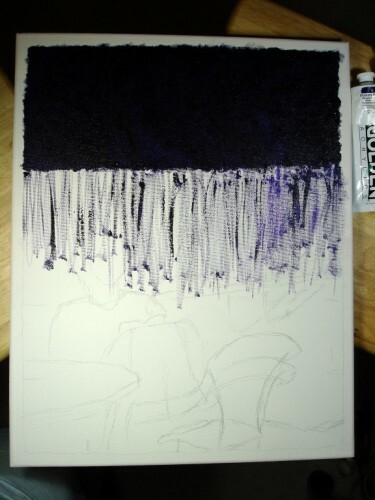 Then onto the big canvas. It was a great day and a great weekend. Isn't life delicious? 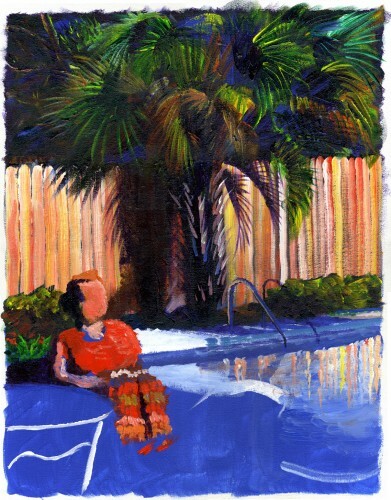 I started on the next work tonight, the big version of "Poolside." This was about halfway through our DVR of Dr. Phil. And then this, just before watching Sean of the Dead with our son, Nick. We'll see how it goes. I did more work on it later, but no pictures. I'll take one tomorrow. 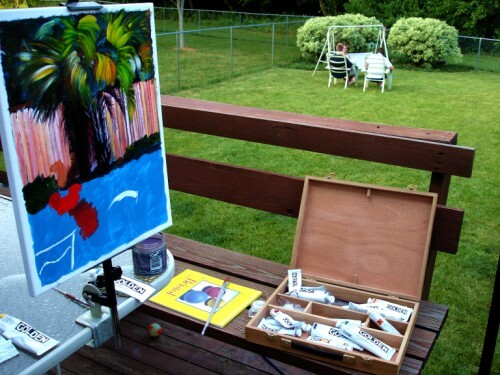 I went onto the back deck today and set up shop and started working on the Poolside painting again. I feel light and airy and I have no clue what I'm doing. But I am having fun, and that's more important than anything else. ETC: A bit later, I have more of it done. Painting this large is a different style of painting and I'm having to adjust quite a bit, so it feels like I'm groping around in the dark. Tamara made a wonderful steak with mashed potatoes, and so we all ate out by the swing in the backyard. I love my family. I thank God every day for my wife and children. 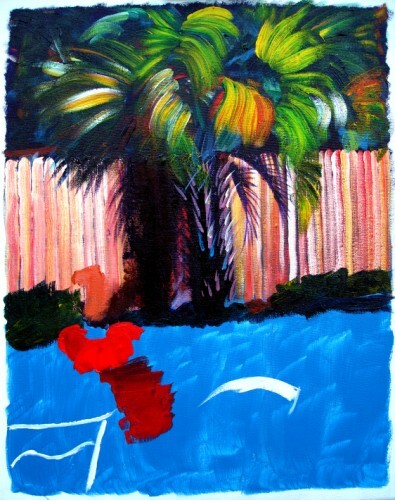 I continue my work on the Poolside painting, and I'm working more texture into the palm tree, as you can see on the right side. I find that achieving adequate lighting indoors is tough for large paintings. It's better in sunlight. 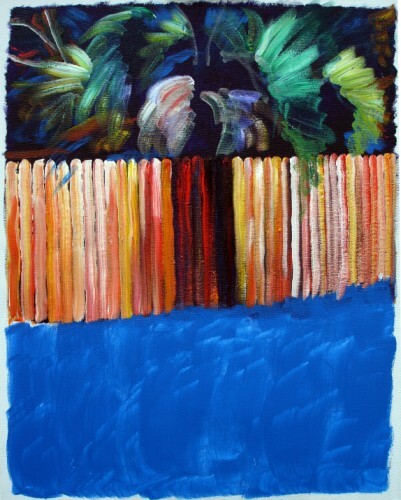 I hope to do lots of work on this painting outdoors tomorrow. I finished my work on texture at the top of the painting, and I'm happier with the result. 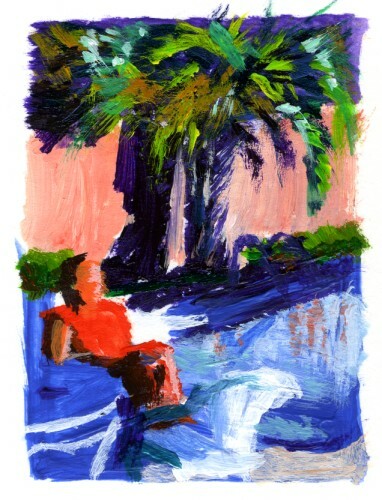 It's not so much that I didn't like the style of the other - I think I'll try that more some time - it's that the painting started having two different styles, and that didn't feel right to me. As my son put it after seeing this draft, "That looks more like your other paintings. I liked the other one, but I like this one too." So I decided to take this opportunity, with the painting about halfway done, to compare taking a photo of the work to scanning it in. 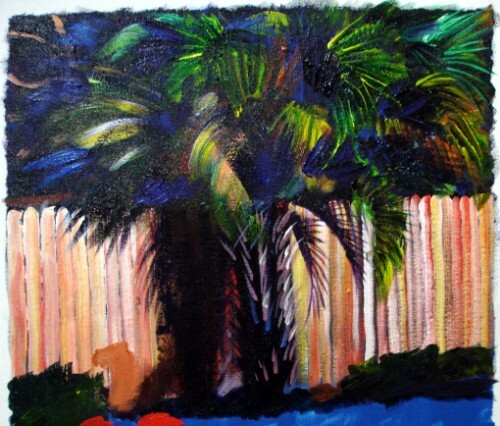 Because it's a 16 x 20 painting, it takes four scans. The photo is more washed out, more dilluted. So the lesson for me here is that unless the painting is simply too large to scan, scanning is worth the effort of assembling the quadrants into a coherent whole. 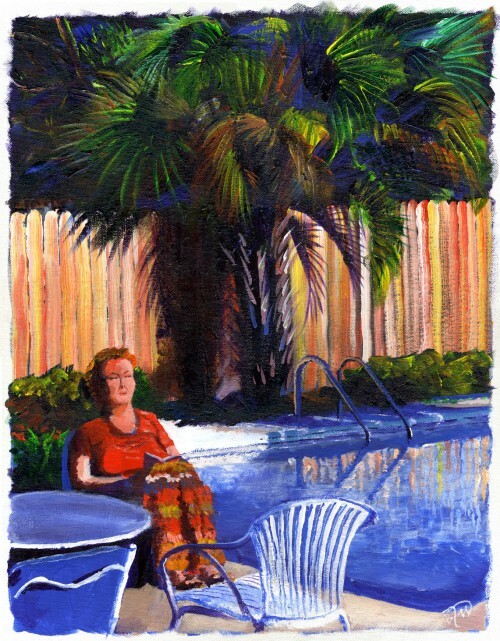 On to the pool and the woman... who happens to be my wife sitting poolside in her parent's backyard, but I'm going to attempt to make her more generic. I've got a couple of problems I need to remedy. First, the head of the woman and her left shoulder are inordinately large. That shouldn't be a big deal, though is it is tricky now near the end to fix things such as that. And the water's upper reflection line rings false as it rises toward the right of the painting. 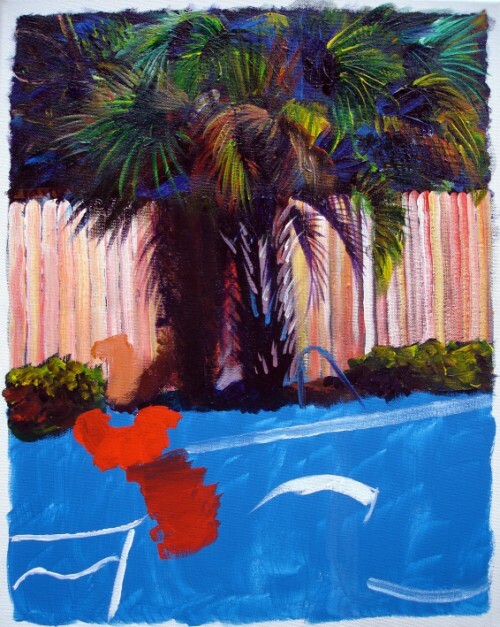 I need to make a second pass anyway on the side of the pool and do the necessary detail work, so that should clean it up. I think two more sessions with this one and I'll have it done. Things I've learned: I really like larger paintings and I very much like filbert brushes. 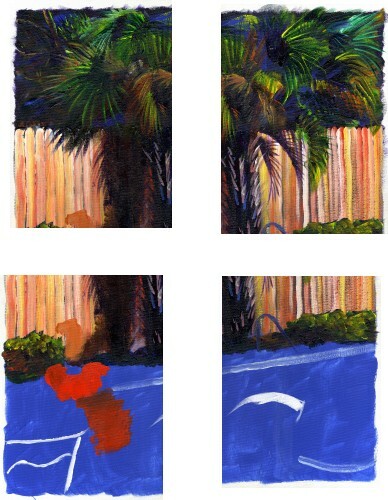 And the video of the painting's progression.